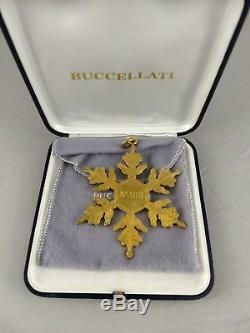 The 1995 Buccellati Sterling Silver Snowflake Ornament, 2.6 oz. Mint with original bag, brochure, and case. 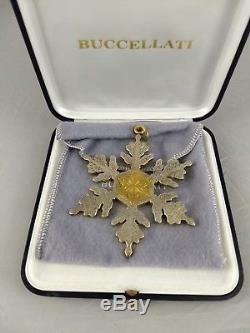 The item "Buccellati 1995 Snowflake Sterling Silver Christmas Ornament, Unused, Mint withbox" is in sale since Saturday, September 15, 2018. This item is in the category "Collectibles\Holiday & Seasonal\Christmas\ Current (1991-Now)\Ornaments\Other Current Tree Ornaments". The seller is "sombreroblanco" and is located in Pittstown, New Jersey. This item can be shipped to United States.